= These are the first pears of the season! It means: in peak, at the right time, the ideal time (season) for something or someone. We usually use this to refer to fruits, fish, and vegetables, that are in season. You can’t use it for food that you see all year round. = Ima shun no yasaitte nani? = What vegetables are in season now? = Ima wa satsumaimo ga shun desu. = Sweets potatoes are in season now. = Mou shun ga owatta. = It is already out of season. = Nanigoto nimo shun ga aru. = Everything has its season. 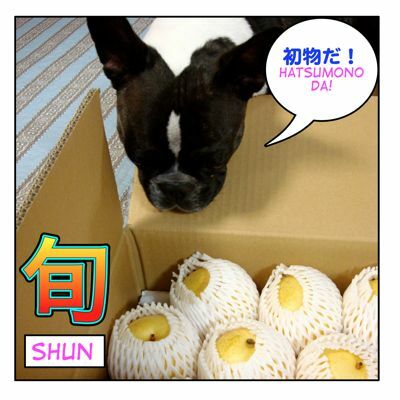 Note : 旬 = shun is not just used for food. Note : While “キテる” ( = kiteru ) is getting popular, 旬 ( = shun) usually refers to something that is at its height of popularity. = They are the first pears in the seasons! We say this when we first see the fruits or vegetable of their season. = Gokinjo kara hatsumon no kaki wo itadaita. = Our (My) neighbor gave us (me) the first persimmons of the season. 日本では今、梨が旬です。= Nihon de wa ima nashi ga shun desu. = The seasonal fruits in Japan are pears. = Minna no kuni dewa nani ga shun desuka? = How about in your country? What’s 旬 = shun now?